Remodeling your bathroom can be an exciting project. Remodeling your bathroom can be an exciting project. However, you will need to realize that it can take longer than a single weekend. Sometimes, it’s easier to do it step by step instead of trying to renovate the entire room at all once. Here is an introduction on how to choose the different fixtures for your new bathroom. When it comes to the type of faucet you want, you’ll have several decisions to make. For instance, you have to think about what sink you have now and the new sink that you want to have installed in its place. Single-hole faucets, as their name implies, only need to have one hole drilled in the deck. They’re an excellent choice for the sink in a powder room and are simultaneously stylish and sensible. Center-set faucets are a good idea for larger bathrooms as are widespread mounted faucets. 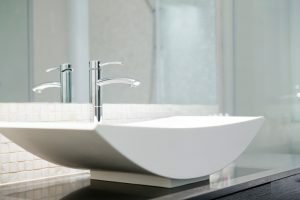 You can also have freestanding or vessel sinks that need to have longer spouts; this means that wall mounted faucets can be a viable choice as well. Once you’ve chosen the type of faucet to go with the sink that you want, it’s time to seal the deal. That’s because choosing a finish is the next step of the process. Sealers can help more affordable options last longer, even if you are afraid of the principle behind “you get what you pay for” – you still get to have as many choices as you want. The downside is you might be overwhelmed with how many options you have: chrome, nickel, stainless steel, bronze, black, white, and highly polished ceramic. Gold is another choice you can make as well, although it is far less common than its counterparts. Saving water and helping the environment has become two concerns that many homeowners have been trying to get better at – this means that there is an opportunity for you to take advantage of the power of low-flow. Replacing your current aerator can help you save money and conserve water all at once. Imagine how happy you’ll be when you save up to 500 gallons of water in just one year alone! No matter what type of bathroom accessories and fixtures you choose, WalterWorks Hardware has the expertise and supplies you need. We are well known throughout the Maryland, Washington, D.C., and northern Virginia area for our fantastic hardware and unbeatable knowledge. For more information, please give us a call at (410) 263-9711 or contact us online. For more tips on choosing hardware for your home, follow us on Facebook, Twitter, LinkedIn, Houzz, and Pinterest. Cities we serve include Annapolis, Baltimore, Columbia, Ellicott City, and Washington, D.C. This entry was posted on Wednesday, April 10th, 2019 at 11:05 am. Both comments and pings are currently closed.